June is busting out all over. The snow is melting and everywhere I look I see flowers in bloom. It feels like summer already. 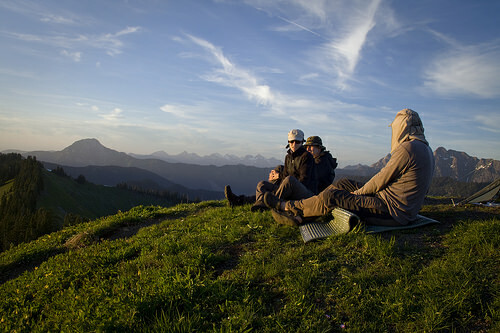 If you crave supreme views of the North Cascades, Excelsior Peak is guaranteed to satisfy your appetite. The vistas, including such icons as Mount Baker and Mount Skuksan, stretch all the way to the Canadian interior, ridge after ridge of wild, rugged territory. Closer by you might see a plethora of colors during the wildflower season or get your hands purple when the blueberries ripen. Excelsior Peak can be accessed from three different trailheads. Damfino Lakes Trailhead involves a long drive on a bumpy forest service road but it will take you the closest. From this trailhead the round trip is 6.5 miles and mere 1,500 feet of elevation gain. You will walk through a pleasant forest for two miles before the views start opening up and rewarding you for the rest of the way to the summit. 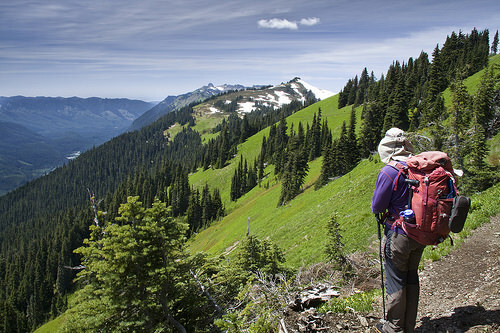 If you are seeking more challenge, hike from the Nooksack Valley might be the right option for you. From the parking lot on the side of Mt. Baker Highway the trail begins to climb through thick forest. It is not the most interesting trail but it lets you climb nearly 4,000 feet and when you emerge in the beautiful open meadows below Excelsior Pass the views will be well deserved. The third option is best executed if you can arrange for a car shuttle or are willing to take your chances hitch hiking between two trailheads approximately 7 miles apart. 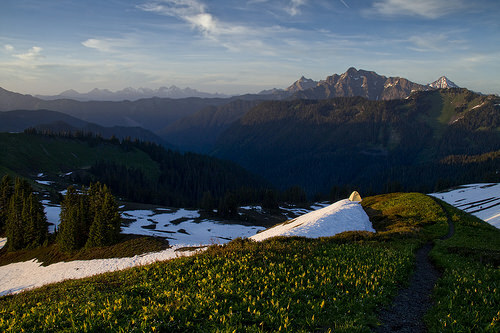 You will start by hiking up to Welcome Pass on a forested and rather steep trail; however this trail is not nearly as rocky as the Excelsior Trail and with the soft cushion of dirt and needles under your feet you will reach the pass faster than you would expect. 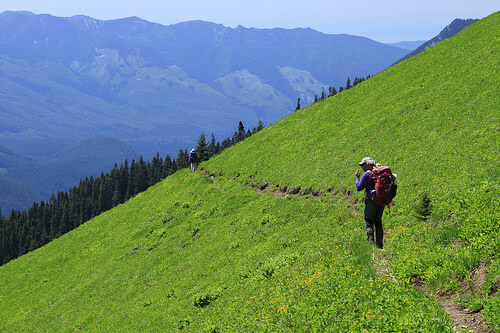 Welcome Pass will connect you to High Divide Trail, ridge run with amazing views, which you will follow all the way to the top of Excelsior Peak. The traverse is then finished by hiking down the Excelsior Peak trail. Withing 5 minutes of our arrival to Excelsior Peak, another hiker climbs up hoping to camp there as well. It was a very close call. In the early season when some snow patches still linger, Excelsior makes for a fine overnight destination. 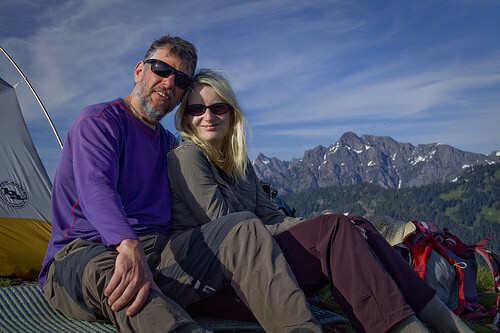 You will often meet photographers with heavy SLR cameras and tripods on their way up. The potential for great sunset colors and night sky photography is phenomenal here. 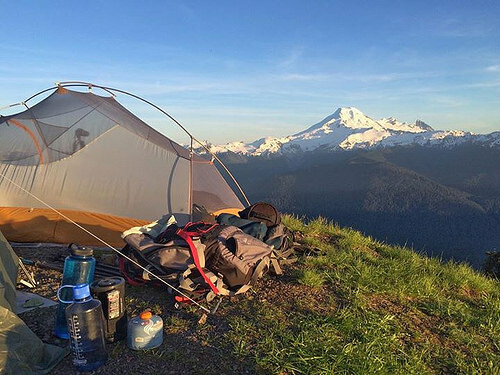 There is space for couple of tents right atop the peak, start hiking early if you want to secure one of them during weekend, and there are several more very nice spots just below the peak at Excelsior Pass. Later in the year, water might be hard to find in the area. Mt. 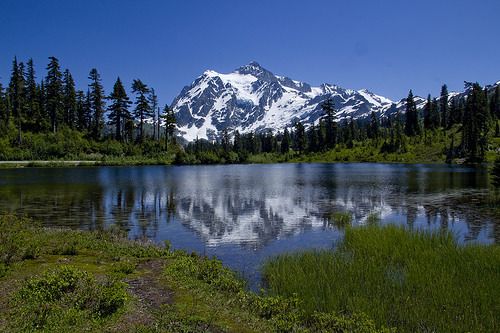 Shuksan reflecting at Picture Lake. Not a part of the trail but a short drive from the trailhead. Thanks for the post. It is a different type of terrain from what I have done. What beautiful pictures. Nice pics! I may take Isabel up there over the 4th (to get her away from fireworks). You think there will still be enough snow up there a week+ from now? It’s hard to say. The slope below Excelsior had decent amount. Any other year I wouldnot hesitate to say yes but with the extremely warm weather I’m not so sure.